LOCATION: This home is located Lake Front and has Gulf Views! 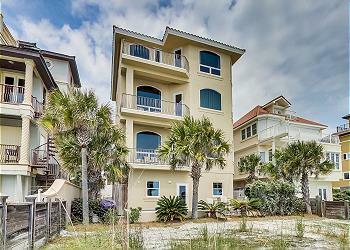 DETAILS: The first floor of this Destiny West home includes everything you need for an exciting beach week! As you pass through the first floor living room you will find a full-sized pool table, wet bar, and a poker table equipped for a fun night in! Just outside this room is an outdoor living space that will take your breath away. Take a dip in the private heated pool and spa or light up the gas grill for an afternoon barbecue! This outdoor living area connects the main home to the carriage house, conveniently equipped with a full kitchen, king bed, sleeper sofa and private bathroom! Back to the main house to find two first floor guest bedrooms that share a convenient hall bathroom. The first includes a queen bed and the second includes a twin bunk, perfect for kids or extra guests! Climb the spiral, grand staircase to find a guest bedroom with a king bed, private bathroom and personal balcony! This floor also hosts the main living room and kitchen. With an open floor plan, the entire crew can relax on the sofa or help prepare dinner in the gourmet kitchen! Don’t miss the greatest feature of the second floor, the private porch overlooking the lake also boasting Gulf Views. Take the convenient elevator or climb the staircase to the third floor, an oasis for the two master bedrooms. The first master includes a plush king bed, a private Gulf side balcony and an enormous bathroom with a large tub, shower and separate steam room. Just across the hall you will find a second master sharing the Gulf side porch with a private bathroom and large closet. This floor also includes an incredibly convenient, additional washer and dryer. 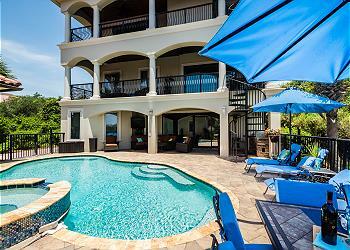 AMENITIES INCLUDE: 6 adult bikes, gulf views, private pool. This property comes with 8 private parking spots. Complete Clean Linen Participant - ALL linens, including comforters laundered upon every checkout. This home was amazing. Plenty of space for our group of four families. The basement was the perfect area for the kids and the pool was very nice. The golf cart was very handy for trips to the beach. The office responds quickly to phone calls and emails. We would recommend this property for any large group. We are so thrilled that you and your group enjoyed your vacation with us in Destin! We agree that this is perfect for larger groups and families and having the golf cart and pool is a wonderful perk! Thank you for staying with 360 Blue, we look forward to seeing you again soon! The house was everything and more than we could have expected! Everything was clean and they had all the amenities we needed. Pool was clean and my boys had so much fun! Thank you 360 Properties! We are so delighted to hear how much you and your family enjoyed your vacation with us in Destin! We agree that this home has perfect accommodations for everyone and having your own private pool makes the vacation that much better! We look forward to hosting you and your family again very soon! Our group trip was the best ever! 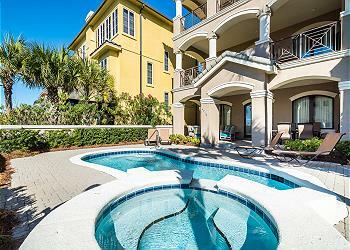 We just had an amazing week in Destin at 71 Vista Bluffs. This place was great! We brought a group of 14 and had PLENTY of room for everyone! The elevator made it real easy on my older parents going between floors, and the golf cart was real handy getting us down to the beach! The kids loved the bunk beds, the bikes and the pool table. 360 Blue made this one of the easiest group trips we have ever done. We will be back next year for sure!!! We are so happy to hear that everyone found something to love in this amazing home! It is truly everything you said and more. We loved having you with us and look forward to seeing you back soon!